In the Solar System, interplanetary dust causes the zodiacal light. Solar System dust includes comet dust, asteroidal dust, dust from the Kuiper belt, and interstellar dust passing through the Solar System. Thousands of tons of cosmic dust are estimated to reach the Earth's surface every year, with each grain having a mass between 10−16 kg (0.1 pg) and 10−4 kg (100 mg). 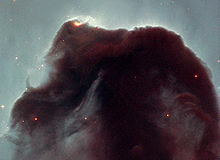 The density of the dust cloud through which the Earth is traveling is approximately 10−6 dust grains/m3.